16" WOOD LOCKBLOCK & JAMB SECURITY PLATE Resists Forced Entry. Strengthens Lockset and Deadbolt Area. LAMINATED VENEER LUMBER (LVL) DOOR STILES LVL Stiles provide structural integrity and strength to the door while composite stiles/rails provide protection against water and insect damage. MOLDED OPEN PANEL DESIGN FOR GLASS INSERTS Adds Structural Performance to door along with perfect fit for glass inserts, plus “Greener” for our environment by limiting/reducing landfill waste. This glass design is certain to impress your guests and passersby alike. Our Silverdale® glass design features reflective bronze beveled glass which only enhances the intricate sparkle and shine effects, making for a true brilliancy that's sure to catch your eye. The rich, dark color of our pre-finished Walnut Oak finish helps make this door one stunning and impactful entryway. This glass design is so versatile and can complement just about any room! It can work as a traditional classic design, yet also look quite chic and contemporary, based on your home's decor. Choose from 7 different species, or Primed MDF that you can paint.... so many possibilities! Check out our beautiful Wrought Iron glass collections! 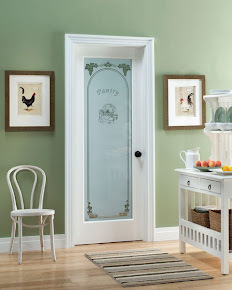 Remember, Feather River offers three gorgeous wrought iron glass collections: Marcello™, Torino™, and Bellante™. See all of our designs here. Get this always classic, always in style, and with grilles between the glass layers, the grilles are always clean! Choose from either a contour or flat bar grille profile. 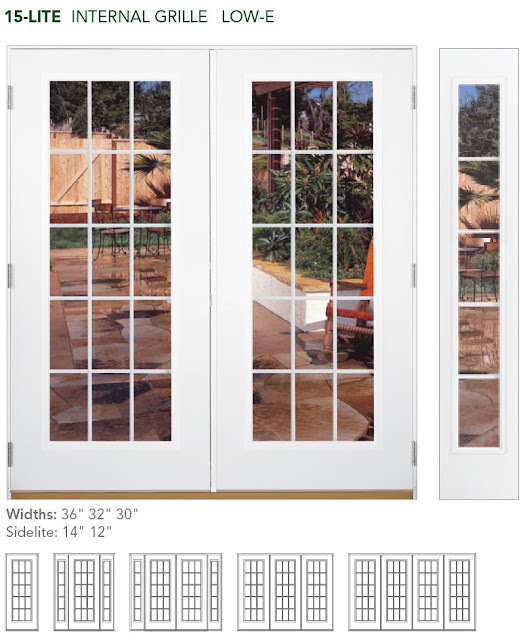 Pair it with corresponding 5-Lite sidelites, or up to four 15-Lite doors to create a truly breathtaking Patio entryway. See our other Patio door options here. Happy pets - Feather River offers Pet doors! Help make your pet happy! We offer Ideal Pet Products' Air-Seal Pet Doors, and Cat Flap doors, in 3 different sizes to best accommodate your pet. See options here! The unique Amber glass offers just enough splash of classic color and warmth to enhance your entryway, without being overbearing. 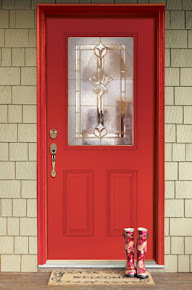 Other door finish colors are Chocolate mahogany and Chestnut mahogany. Door is available with or without a dentil shelf. Pair it with one or two matching sidelites to create your beautiful entryway.